Crowns are used to fix teeth that have been broken, cracked, or are too riddled with cavities to receive any more fillings. Crowns are made of synthetic material and are custom made to fit over each individual tooth. If you have a crown or crowns, you might be wondering if it’s possible for them to get cavities. The simple answer is: no. 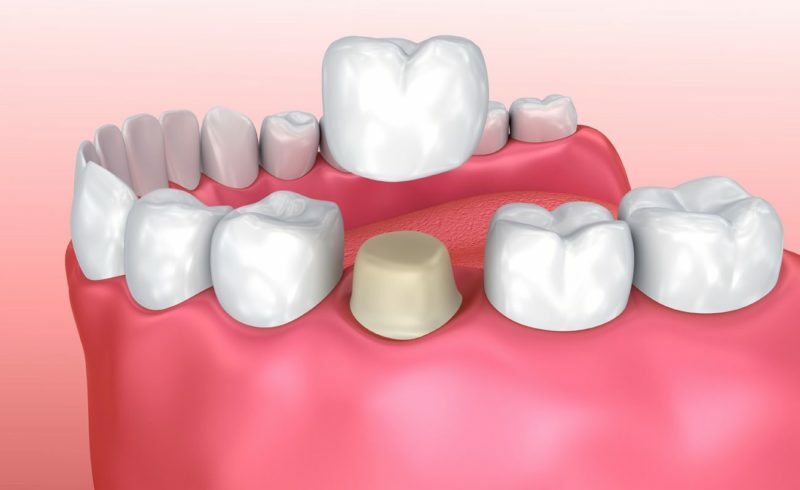 Since crowns are made of synthetic material it is impossible for them to get cavities; however, it is possible for the tooth underneath the crown to get cavities. A crown is permanently attached to your tooth and usually covers the entire tooth down to the gum line. The area around where the crown is attached is called the margin. The margin often falls right above, at, or slightly below the gum line and leaves some of the remaining tooth exposed and vulnerable to cavities. The crown can gather plaque and encourage bacteria to grow. If the tooth succumbs to a cavity, you will need to have the crown removed, the cavity filled, and a new crown fitted and attached. Getting a crown does not need to be a long, drawn out experience. Nowadays, many dentists offer same-day crowns. Your dentist will take a scan of your tooth and use a 3D computer program to design and manufacture the crown while you wait in the office. Once the crown is created, your dentist will bond it to the tooth in question. It’s important to keep your crown and the remaining exposed tooth clean. You should continue to brush at least twice a day and floss once a day. Maintaining good oral hygiene is important for both your natural and synthetic teeth. It’s advised that you visit your dentist every six months for a regular check up. Your dentist will check the margins of your crowns for any signs of decay. Often catching and treating dental problems early can save you a lot of trouble and money in the future.